Runaway tycoon Vijay Mallya sure has put the cat among the pigeons. His causal reference, while taking a break from his London court hearing on Wednesday afternoon, that he met the finance minister before he left India in March 2016, has created a political storm, back home. Both the Congress and the BJP are pointing fingers at each other blaming each other for Mallya’s easy access to bank loans and his subsequent getaway leaving behind a whopping Rs 9,000 crore debt. 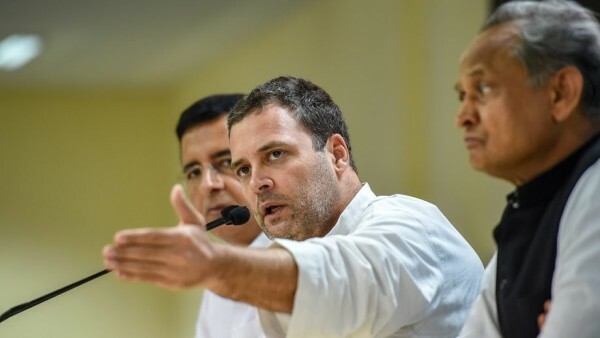 Congress President Rahul Gandhi on Thursday demanded Finance Minister Arun Jaitley’s resignation after accusing him of colluding with fugitive businessman Vijay Mallya “and giving him a free passage” to flee the country. Addressing the media at the Congress headquarters here, Gandhi asked why the Minister did not inform the investigating agencies about Mallya’s plans to leave India. “There is a clear-cut collusion. He (Jaitley) should have confessed (about the meeting) and he should resign,” said Gandhi. At the media conference, party MP PL Punia claimed to give an eyewitness account of the meeting between Jaitley and Mallya in the Central Hall of Parliament before the businessman fled the country on March 2, 2016. “The Finance Minister talks to an absconder (Mallya) and the absconder tells the Finance Minister that I am going to London. The Finance Minister neither told the CBI, the ED or the police, why? “He was given a free passage to leave the country by the Finance Minister,” said Gandhi and alleged that the logistics of Mallya going out of the country were discussed at the meeting. Punia claimed the meeting between Jaitley and Mallya lasted 15-20 minutes and alleged that Mallya took Jaitley’s permission after holding consultations with him about his planned flight abroad. “The meeting happened on March 1, 2016, a day after the Union budget was presented. In the Central Hall, initially, Mallya and Jaitley were standing and were talking intently. Then they moved to the benches in the Central Hall and were seated and talking,” said Punia. “Later, on March 3 morning, news appeared that Mallya left the country on March 2. My first reaction was that I had seen them together in Central Hall a day earlier,” said Punia. The MP said he had referred about the meeting in his interactions with the media. “I am surprised that for last two and a half years, the Finance Minister never referred to this meeting. It was not a short meeting but a formal meeting. There is CCTV facility in Parliament and their meeting can be verified from the footages. “It is very clear that Mallya took his (Jaitley’s) permission after holding consultations. It is our charge and inference that he (Mallya) went with his (Jaitley’s) concurrence. “It is a serious issue. Either he (Jaitley) quits politics or I will quit,” said Punia. He also questioned why Jaitley did not inform the CBI, ED or the police that Mallya had told him about his plans to go to London. “Our first question is an absconder tells the Finance Minister that I am going to London and the Finance Minister doesn’t refer it to CBI, ED or the police. “Our second question is there was a lookout notice against Mallya which was diluted to an inform notice. Who changed it? This can be done only by one who controls the CBI,” he alleged. He also demanded to know if the decision was taken by Jaitley himself or the “order came from the top”. Referring to Jaitley claiming that his meeting with Mallya was in the corridor of the Central Hall of Parliament, Gandhi demanded to know why Jaitley did not tell the CBI about this. On a question, if the meeting was a coincidence, Gandhi replied: “How can it be a coincidence? The Finance Minister is responsible for taking action against economic offenders. The AAP also demanded Jaitley’s resignation and said he should write a blog clarifying whether he was aware of fugitive businessman Vijay Mallya’s plans to leave India. “Since he (Arun Jaitley) is famous for writing blogs on every issue, he should write a blog apologising to the people of the country and submit his resignation until his name is cleared in the case,” Aam Aadmi Party (AAP) leader Dilip Pandey told the media here. Pandey asked as to “who gave CBI the order to convert the lookout notice for Mallya into a reporting notice” and how could the Central government not be aware of Mallya’s actions. “All the departments investigating Vijay Mallya come under Arun Jaitley, so saying that the government was unaware of Mallya’s actions is making a fool out of the country,” he said. On the other hand, party’s national secretary Pankaj Gupta demanded a white paper from the Bharatiya Janata Party (BJP) -led Central government on how Mallya managed to flee India. “We demand a white paper … on how Mallya fled the country and tell the people what contribution the government had in his leaving India. Under the present circumstances, we don’t think the government wishes for Mallya’s return because if he does then a lot of ministers’ reality would be exposed,” he said. The BJP was quick to hit back alleging that the UPA government gave “sweet deals” to the fugitive businessman and claiming that the Gandhi family “partially owned the now-defunct Kingfisher Airlines through proxy”. “There are documents that show how the RBI and UPA under Sonia Gandhi and Manmohan Singh had given sweet deals to Kingfisher Airlines,” Bharatiya Janata Party (BJP) leader Sambit Patra told the media. The accuracy of the documents could not be ascertained. There was no immediate response from Rahul Gandhi’s office. Patra also alleged that the party has enough evidence which shows that Rahul Gandhi was “using black money” and the Gandhi family was helping Mallya with sweet deals. He said that Rahul Gandhi travelled free on Kingfisher Airlines, which was once owned by Mallya. “Rahul Gandhi took one crore loan from a shell company, we have the confession of the company director Umashankar Gupta,” Patra said. The BJP leader also demanded that the Congress President “clear the air over his family’s relations” with Mallya. Earlier in the day, Union Law Minister Ravi Shankar Prasad told reporters that all the allegations against Jaitley were “false”. “All these allegations are false. I want to question one thing, all these remarks are being made after Rahul Gandhi’s London visit,” Prasad said. “Is there anything common between them (Mallya and Rahul Gandhi)?” the Law Minister asked. He also said that since 1947 till 2008 the banks in the country gave loans to the tune of Rs 18 lakh crore.